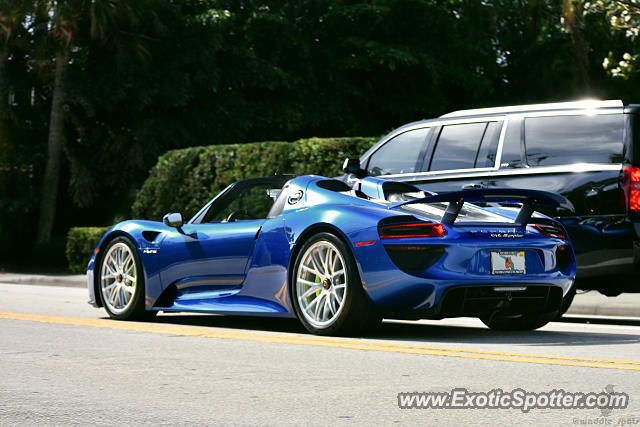 A casual spot of a 918 Spyder along S County Rd. @CoolCarGuy1506 The license plate is actually normal on the car; I edit the tag text out of my photos. It's just a personal choice of mine. I understand many of the arguments that other spotters/people have regarding how it's perfectly normal to post a tag number, but I've always preferred to just leave the tag out of it. What's that licence plate all about? Beautiful shot and beautfily car. Agree with MinnesotaCars, looks so much better than gray! I dont see it in blue often, great spot! Thanks! Yeah it does seem like most 918s are neutral colors. Great find for sure! I love this in different colors than grey! Blue is a great color for it!